Credit cards can be a lifesaver when you run out of cash or you have to pay for expensive items such as holidays or furniture. Credit cards also play a heavy role in Christmas as the easiest way to pay for presents, food and other 'must-have' seasonal items. If you are planning to use your credit cards to help pay for Christmas this year, here are some important dos and don’ts to remember. Christmas is always the most expensive time of the year. There are approximately 5 million adults still paying off debts piled up from last Christmas, so it pays to plan ahead. Think about putting some money aside each month to help pay the cost of Christmas. The more you can save for Christmas during the year the less you will need to borrow come Christmas time. It’s all too tempting to put off worrying about how much you are spending when out Christmas shopping, but when the credit card bill arrives with a thud on your doormat in January, you could be in for a nasty surprise. Make sure that you draw up a budget of your Christmas spending and try to keep yourself within an agreed limit. 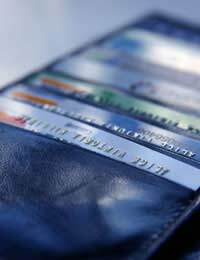 Most people fail to realise how different credit cards can have a marked impact on your finances. Choosing the right credit card could save you hundreds of pounds in interest, and some can even repay you money. As well as looking at annual percentage rates (APR) of interest, look for cards offering interest-free repayment periods or extended periods on purchases or cashback offers. If you struggle to pay off your card in full each month, think about finding a card with a low repayment rate that will last for as long as it takes to repay the debt in full. Most people who have shopped in a department store will have been asked by the shop assistant whether they wanted to take advantage of their store card. This can, however, be a very expensive form of borrowing, with interest rates often far in excess of even credit cards. Some store cards charge an APR of as much as 30%. One third of people with a credit card forget to look at their monthly statement. This is a mistake and could be made worse at Christmas time when your card will be used heavily and the likelihood of mistakes appearing on your statement are increased. You should always check your statement and be on the alert for any transactions that you don’t recognise. If you spot something suspicious, no matter how small, report it to your credit card company immediately. Many credit card fraudsters make small transactions on a card as a way to test whether the fraud will be detected, before taking out larger sums. Be vigilant and keep your cards close at hand at all times.